Gaspar Ballet at Straz Center! Hello guys.. Julian back with some more awesome entertainment news for those that love really good and exciting ballet! Gaspar-A Pirate Fantasy, a swashbuckling ballet, is being restaged locally after a 16 year absence from the Tampa Bay area. Creator/Choreographer Christopher Fleming will produce the original, full-length classical ballet at the Straz Center for the Performing Arts on January 30, 2011 at 2:00 pm and 7:30 pm to coincide with Tampa’s annual Gasparilla Festivities. The original score is by Tampa Bay’s own David Goldstein, M.D. The Richard and Sharon Sanchez Family Foundation has agreed to be the presenting sponsor. Gaspar-A Pirate Fantasy tells the tale of Tampa Bay’s most famous pirate, José Gaspar. 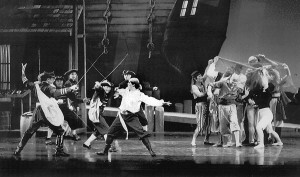 The pirate/love story will include local dancers and performers as well as students from the Patel Conservatory. The production will feature principal dancers from New York and Philadelphia. All proceeds from the ballet will go to local non-profits including the Tampa Bay Chapter of the American Red Cross and the Florida Chapter of Operation Homefront, as well as Drew’s Shoes, a charity dedicated to providing dance shoes for underprivileged children. Tickets on sale through the Straz Center ticket office. This sounds really cool to me! Check back soon here often, so we can keep you up-to-date with all the exciting things to do in Tampa Bay and Tampa Bay events!